The Doomed Bird perform the Massacre 12th November 2011. 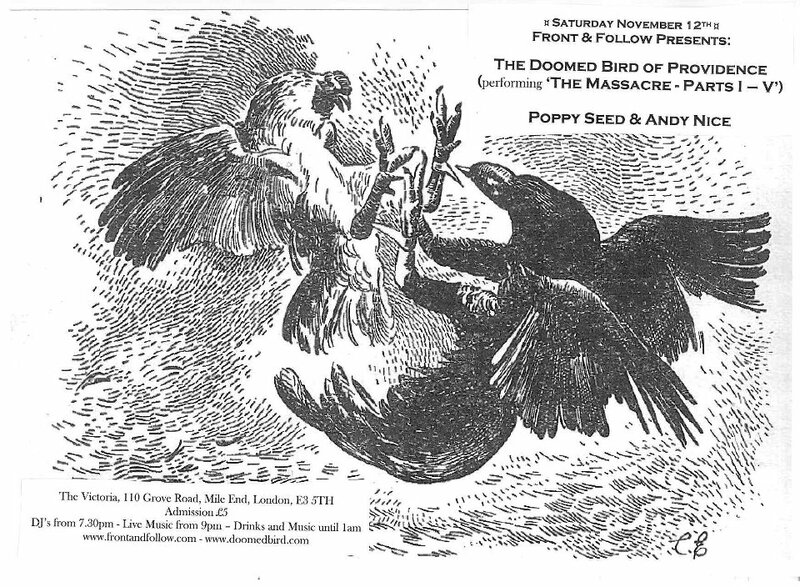 The Doomed Bird of Providence – The Australian Doom Folk ensemble will a present a special performance of ‘The Massacre.. Parts I – V’ taken from their debut album ‘Will Ever Pray’ and serialised on Tom Ravenscroft’s BBC6 show earlier this year. Poppy Seed – the debut London show of Nottingham band Poppy Seed, the musical project from Sophie Lester featuring Chris (Yonokiero/Hirameka Hi-Fi) Baldwin. Best described as “Etta James meets the Angels of Light”. Andy Nice – as heard contributing cello on record and on tour as part of The Tindersticks. Andy’s solo work uses multiple layers of cello creating dynamic, beguiling and unique sounds befitting of a man who has worked with such diverse acts as Cradle of Filth, Luke Haines & Sade during his illustrious career.